Fallen trees, will your insurance cover you? Home/News/Blocks of flats/Fallen trees, will your insurance cover you? It’s always sad to see a tree brought down by winter storms, and there have been quite a few that have fallen victim to high winds this year already. If the worst happens and a tree falls in your grounds, damaging your property or that of your neighbours, are you sure your insurance will cover your losses? The claims process will usually involve a site visit and report by a loss adjuster. It is this report, which will include an assessment of the cause, which often determines whether or not your insurance will cover any losses. Healthy trees, where there is no doubt they have been brought down by storm are usually covered, but if a tree has been neglected and is in poor condition your insurance may not pay out, particularly where there are no records of inspection by a suitably qualified person. 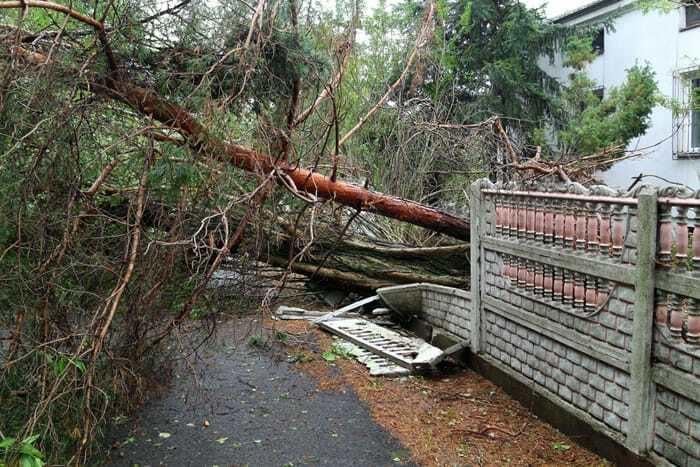 While your third party liability will cover the cost of damage that occurs on neighbouring properties, for example a tree falls on cars outside your property boundary, the cost of actually removing the tree may not be – and for large trees this can be very costly. The moral of the tale? Check your buildings insurance policy to see what it covers under ‘trees’ and invest in a tree surgeon to prepare a report on older specimens. Make sure the reports are kept safe in case you need to use them. A tree surgeon will also be able to advise on anything that needs doing to make a tree safe, for example removal of branches, and whether or not there’s a local Tree Preservation Order. When getting insurance quotes, make sure you provide full disclosures about any trees in your grounds. A tree filled garden doesn’t necessarily mean a higher premium, but damage caused by a risk the insurer did not know about – or that is caused by lack of maintenance – can be very expensive. Call us if in doubt, our team will talk you through the declaration process to ensure you’re covered. Trees and subsidence Trees and shrubs need large amounts of water to survive, and a mature deciduous tree can extract over 50,000 litres a year from your grounds. In drought conditions trees will send out extensive root systems looking for water, affecting the ground up to a depth of 6m. Now that may not seem to be a worry after the wet weather we’ve been having, but in the medium to long term it’s worth bearing this in mind. The Association of British Insurers has identified trees more likely to cause problems and says that those most often involved in subsidence incidents are ash, willow, sycamore, ash, plane and poplar. This is generally only a problem on shrinkable clay soils. Buildings up to four storeys constructed before the 1950s are most at risk, as they frequently have foundations only 50cm (20in) deep.